CHARLOTTE, N.C., Nov. 25, 2015 -- The Federal Energy Regulatory Commission (FERC) today issued a new 40-year operating license to Duke Energy for the Catawba-Wateree Hydroelectric Project. It became effective Nov. 1, 2015. 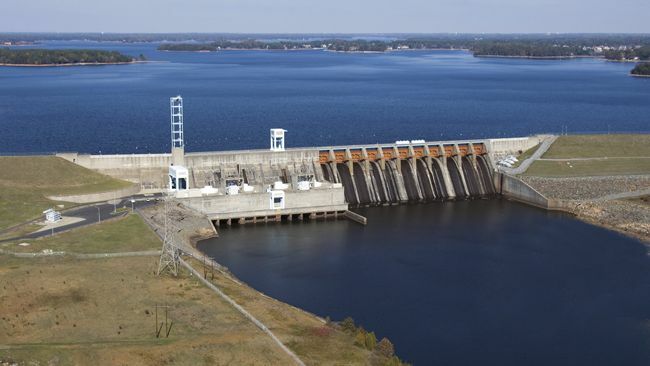 The new license allows the company to continue operating its 13 hydroelectric stations and 11 associated reservoirs located along the Catawba-Wateree River in North Carolina and South Carolina. "The significance of the new license cannot be overstated," said Steve Jester, vice president of water strategy, hydro licensing and lake services for Duke Energy. "Receiving the new license ensures the Catawba-Wateree River will continue to support and sustain communities across the Carolinas for at least the next 40 years." "In addition, Duke Energy can now take action on the many benefits which will enhance the region and environment for generations to come," he said. Receiving the license is the result of an extensive three-year collaborative process with community stakeholders representing 85 organizations, including state and federal resource agencies, local governments, a Native American tribe, community organizations and private citizens. "This license represents the input of many people and organizations. As a result, the river will be managed in a balanced way so its natural, cultural, recreational and economic resources are protected and enhanced for our future," said Vicki Taylor, executive coordinator of the Catawba-Wateree Relicensing Coalition. "We will have more places to swim, fish, picnic, hike, boat and camp. Due to operational changes, the habitats of native plants and animals will be improved." The stakeholders held more than 300 public meetings to discuss river-related interests, review scientific study results and craft a collective vision to meet the region's needs. The effort resulted in a Comprehensive Relicensing Agreement (CRA), which the FERC incorporated into the new license. "The stakeholder teams get the credit for the successful outcome," noted Jester. The new license also allows Duke Energy to continue meeting customers' needs by securing the necessary resources to operate current and future power generation facilities including its hydroelectric sites, which are vital for meeting peak demand. "The Catawba-Wateree River supports and sustains the vitality of the region," said South Carolina Sen. Wes Hayes of York County. "The new license is a testament to the importance of regional collaboration and working together to find solutions to meet our water and energy needs." Requirements of the license are tailored to the region's priorities, including expanded recreational access and amenities and scheduled releases of additional water flow for recreation. It also addresses water quality enhancements, a new drought management protocol, long-range water supply planning, land conservation, expansion of aquatic habitats, protection of endangered species and preservation of historic and archeological resources. Duke Energy voluntarily implemented many measures early, while others will be put in place in the coming months and years. More than half of the 89 new or enhanced public recreation areas will be completed within approximately five years and the rest within approximately 20 years, pending the necessary FERC approvals. The eagerly anticipated recreation amenities focus on public swimming and paddling opportunities, along with camping and the creation of new trails along and near the lakes and river. The Great Falls community in South Carolina will have water flowing in bypassed reaches of the Catawba River for the first time in more than 100 years. "With the new license issued, the possibilities and opportunities coming to Great Falls are numerous," said Glinda Price Coleman, executive director of the Great Falls Home Town Association Inc. "Residents and visitors will enjoy the new whitewater rapids, fishing areas, kayak put-ins and other natural attractions many did not know were in the community. Our downtown is ideally located near the new amenities, and we are eager to take full advantage of it." Other important outcomes of the relicensing process include two regional stakeholder groups focused on protecting and preserving water resources. The Catawba-Wateree Drought Management Advisory Group (CW-DMAG) works collectively to respond to drought conditions and implement conservation measures. The Catawba-Wateree Water Management Group (CWWMG) is focused on long-range planning and advancing a water supply plan for the region. "The relicensing process brought regional water suppliers, resource agencies and industries together to address important issues," explained Barry Gullet, director of Charlotte Water and chair of the CWWMG. "Today, our region is a model of proactive involvement for sustainable water resources through the creation of several stakeholder groups like the CW-DMAG and CWWMG." The Catawba-Wateree River provides the region with affordable and reliable energy as well as drinking water. The hydro project is essential to Duke Energy Carolinas' generation fleet, providing 843 megawatts of clean, renewable and flexible hydropower and cooling water to 7,721 megawatts of fossil and nuclear generation, which collectively represents 25 percent of Duke Energy's power generation capacity in the Carolinas. It provides drinking water for nearly 2 million people and is an important source for industrial water supply. In addition, more than 10 million residents and visitors enjoy recreation access areas each year. The project was originally licensed for 50 years in 1958. Duke Energy filed the application to relicense the project in August 2006. The application process was delayed by several challenges which were successfully resolved. Duke Energy will carefully review the terms and conditions of the new license during the next 30 days and will file a Request for Rehearing with the FERC if there are items requiring clarification or correction. 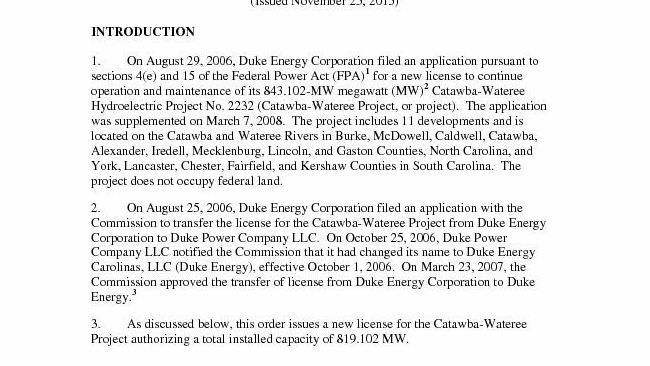 To view the anticipated implementation timeline, visit www.duke-energy.com/pdfs/catawba-wateree-new-license-timeline.pdf. A list of planned recreation amenities can be viewed online at www.duke-energy.com/lakes/catawba-wateree-relicensing.asp under "Final Agreement & Lake Summaries." For more information about lakes and recreation resources managed by Duke Energy, including relicensing information, visit www.duke-energy.com/lakes. Learn more about the Catawba-Wateree Drought Management Advisory Group (CW-DMAG) at www.duke-energy.com/lakes/cwdmag.asp. Learn more about the Catawba-Wateree Water Management Group (CWWMG) at www.catawbawatereewmg.org.